This feature allows you to send a console message to a user logged on to a remote computer. To open the Send Console Message form, right click on a computer and select Computer Management Tasks -> Send Console Message command. Alternatively, you can use Ctrl+M as a shortcut to open the form. The text of the message you want to send. Allows you to specify a method that will be used to console message. 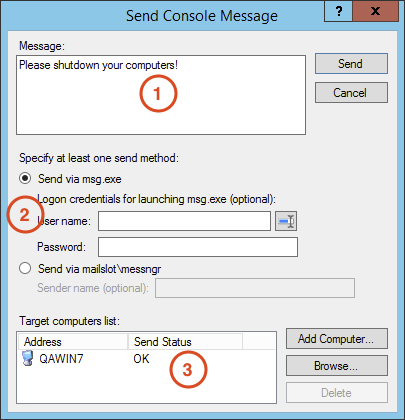 msg.exe Launches msg.exe tool to send a console message. This is the recommended method for sending console messages. mailslot\messngr Opens an IPC connection to the Windows Messenger service via MAILSLOT\Messngr protocol. Target computers list appears in this pane.